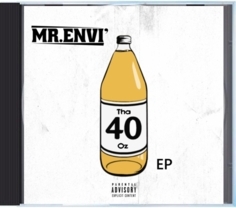 Mr. Envi’: Back in high school I was in a rap group called Triad and performed throughout the area. After graduating I joined the military and was drawn back to it while in Germany. 1999 was the year it got serious and linked up with a label called Ruff Dogg, Inc (now known as Ruff Dogg Entertainment) who released a compilation album titled The Outfit. That was the first official project I was a part of and from then on, I was more intrigued with the music industry. The biggest piece of advice I have for the youth would be to remain consistent. I look at it like this. If you slack off for a week, it’s like being off for a month. And if you slack off for a month, it’s like being off for 3 months. You feel me? So, if you’re in the studio constantly recording, don’t sit on your music – put it out. One of the hardest challenges would be being my own booking agent/manager. Since my manager passed away last year (RIP Reggie), I’ve had to take on the role. Another challenge is finding a solid marketing campaign for the indie artist/label budget. I’ve used many marketing services in the past and they all seem to be full of hot air. I came up in the 90’s era of music. With that being said, the old guerrilla in your face marketing and promotional tactics are still effective to this day. Social media has proven to be quick and somewhat effective, but you have to do more than that. If you don’t have a budget for radio or magazine ads, then flyers and street teams (Snipes) is the next best thing. I’m originally from Alabama, but I’ve been living in Louisiana for the past 15 years now. In the Shreveport/Bossier City metro area, the fans tend to follow artists that sound like their style of music. As far as the artists, there a lot of talent but a lot of them follow trends and those who are exceptional tend to get over looked in my opinion. A year from today I see myself expanding my fan base, selling more records, and having bigger tours. Also, I have a few business opportunities on the table. I hope those go well and come into fruition prior to next year. In today’s industry, it seems like it has gravitated to being independent or as I like to call it “The Age of Independence.” With that being said, I tend to keep a watchful eye on artists who make an impact in the game without a major. Artists like Tech N9ne, Devin The Dude, Curren$y, and Chance the Rapper. Honestly, I’m not a big fan of the mainstream music of today, but there are some underground and independent artists out there that have made significant progress over the past few years. © 2018 Copyright. Ethereal theme. Powered by Blogger.